Diamond Cuts | What Is An Ideal Diamond Cut? A diamond's cut is considered to be the most important of The 4 C's. It is important to understand how a diamond's proportions and the relationship between them affects its brilliance, fire, and scintillation. Read on and we will provide you with a thorough understanding of diamond cut. Better yet, watch our video titled, "Diamond Cut." It will describe to you both the simple understanding of cut and the complexities , which should get you to seek expert advice when it comes to selecting the prettiest diamond that you can afford. Cut, more than any other quality aspect, gives the diamond its sparkle. A diamond gets its brilliance and scintillation by cutting and polishing the diamond facets to allow the maximum amount of light that enters through its top to be reflected and dispersed back. When all the angles are correct, the light that enters is dispersed back through the diamonds top facets. Most diamonds are cut to retain maximum weight from the original rough. A heavier diamond will result, but so does a dramatic sacrifice of potential fire and brilliance. The width and depth have the greatest effect on how light travels within the diamond, and how it exits in the form of brilliance. When a diamond is cut too shallow, light leaks out of the bottom, brilliance is lost and the diamond appears watery, glassy and dark. A diamond with these characteristics is referred to as a "fisheye". When a diamond is cut too deep, light leaks out of the sides, brilliance is lost and the center of the diamond will appear to be dark. A diamond with these characteristics is referred to as a "nailhead". Experts express differing opinions on the best table size (the diameter of the largest facet on the top of the stone) and the best depth for a diamond, because these factors alone are not sufficient to accurately judge its cut. Other factors - crown angle, girdle thickness, pavilion depth-percentage (the ratio of depth to girdle diameter), culet size, polish and symmetry - also play a role in judging a diamond's overall cut quality. A diamond's cut is graded by several measurements. Its depth percentage (a measurement of the height vs. the width of the stone) and its table percentage (a measurement of the diameter of the top facet of the stone vs. the stone's average width) are two key factors in determining the quality of a diamond's cut. These percentages are detailed on the GIA Gem Trade Laboratory Diamond Grading Report that accompanies every A. Fishman & Son loose diamond. Although polish and symmetry are graded under 10X magnification they can both have an effect on the overall appearance of a diamond. Polish refers to the quality of the diamond's surface and includes such features as nicks, polish lines and abrasions. Symmetry refers to the exactitude of the shape and alignment of the facets. The polish and symmetry grades are listed in each diamond detail page and within the GIA diamond grading report. GIA graded diamonds will have polish and symmetry grades of excellent (EX), very good (VG), good (G), fair (F), or poor (P). A. Fishman & Son does not carry lower quality diamonds with polish and symmetry grades of fair or poor. How Does A. Fishman & Son Grade Diamond Cut? 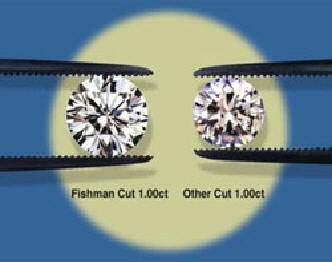 A. Fishman & Son uses cut grades provided by GIA whenever these are available. Many diamonds graded by the GIA prior to January 1st, 2006 do not have such grading. If a cut grade is not provided by the GIA, A. Fishman & Son has evaluated the overall beauty of the diamond and assigned it a Cut Grade based on both a proportion system that uses measurements of depth and table, and an actual visual analysis of the diamond to determine the amount of brilliance in a particular diamond’s cut and how Pretty it is. Unlike sites like BlueNile, which can only use a system of statistics to grade the cut of diamonds which they list (but don't own), because they don't have the physical diamond available on hand to look at, A. Fishman & Son owns its diamonds and only purchases diamonds which are pretty and which we can wholeheartedly recommend to you. That is why we can give you a physical evaluation of our diamonds. For example, this is BlueNile's cut grading system for Round diamonds. We think it is very inadequate to allow you to know whether you are getting a pretty diamond worth purchasing. Here is our evaluation of their criteria based on 60 years of experience in buying and selling diamonds. The bottom line is that you must speak to a diamond source that really knows diamonds and who spends his own money to purchase them. That is A. Fishman & Son! We consider a combination of 59.5% depth and 58-59% table to be even better. A Depth % greater than about 62.5 is really very undesirable, as is a table under 54%. The combination of a 64 depth and 52 table is a very ugly or very small looking diamond. A. Fishman will not sell diamonds at these extremes. We consider diamonds with depths greater than 63 and less than 58, and tables less than 54 and greater than 62 to be undesirable. This photo illustrates why we reject diamonds with heavy depths above 63. The diamond on the right is what you get with such statistics. That type of diamond will always sell for less than the diamond on the left. But what are you getting for that lower price? You are getting a diamond which looks much smaller than it should. If you figure what you are paying for the effective size of the diamond, what it looks like, you will find that you are paying a lot more for a lot less. Beyond the 4 C's: What You Should Really Know Before You Buy A Diamond. How do you know if you are buying a Pretty Diamond?